All rural places and buildings are a reflection of how people have lived, worked, thought and related to each other throughout history. Rural settlement – the villages, hamlets, farmsteads and houses that we call home and visit – is at the core of our everyday lives, connecting us to each other, and to our shared sense of history, and providing a base from which we view and enjoy the wider landscape. Identify and then champion the distinctive characteristics of an area, focusing on how all buildings of different dates are sited and experienced within the landscape. Identify and assess the forms of settlement, buildings and other features – from open spaces to fields and woodland - that make up the whole environment, afford habitats for wildlife and make it special for people. Use this fresh understanding to inspire and guide Community-Led Plan policies to ensure that new development responds to local character and distinctiveness, in line with national and local planning policy. Supporting guidance Your Place Matters: Understanding Buildings in their Setting in Rural Worcestershire provides more detailed information on the broad range of rural building types and their landscape and settlement context. 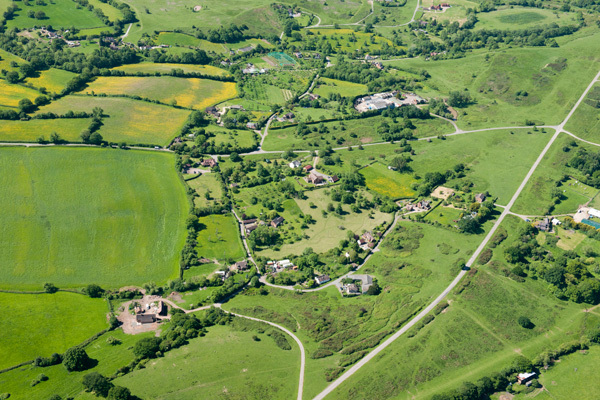 The distinctive pattern of small scale fringe settlement encroaching unenclosed land can be seen around surviving commons at Castlemorton and Birtsmorton, on the Malvern Fringe. Photograph © Historic England NMR 29434_013. A 'Synthesis of Rural Buildings in their Setting: Project Report, Case Study and Research Questions' forms one part of a multi-layered project focused on Worcestershire. A collaboration between Worcestershire Archive and Archaeology Service and Historic England, the project aimed to build on a decade of place-making research in Worcestershire and promote a strategy and method to stimulate better understanding of the wide range of rural building types in their setting. A 'Synthesis of Rural Buildings in their Setting: Project Report, Case Study and Research Questions' incorporates a broad overview of rural buildings in their setting, in east Worcestershire, based on a synthesis of existing knowledge, research, and the products of previous assessment and characterisation projects. By taking a step back and looking at a place in its broader context the report aims to promote a framework within which an understanding of landscape can enrich our understanding of rural buildings and historic places. It promotes a back to basics interdisciplinary approach to understanding rural buildings as part of their wider context, and aims to support professionals working with whole landscapes, including local authority archaeologists and strategic planners, as well as local researchers. It also offers a framework to guide further research. This framework has been designed to complement both the community planning toolkit ‘Your Place Matters: Community Planning for the Future of Rural Buildings and their Setting’ and existing guidance on the recording and research of traditional farmsteads, outfarms and smallholdings in Worcestershire. See ‘Worcestershire Farmsteads Recording and Research Guidance’.